Apple had an action-packed kickoff for its Gather Round event on 12 September. Before unveiling its anticipated 2018 flagship phones and Watch Series 4 to finally cease all rumor mills, the brand introduced audiences around its “spaceship” headquarters in a Mission: Impossible-themed video, which included Apple’s Tim Cook ‘mistakenly’ tweeting out to staffers in moment of panic. The introduction opens with a girl named ‘Alison’ dashing out of a conference room carrying a metallic suitcase. She makes her way out of the atrium and into a courtyard where she is greeted by a large pond. She then asks ‘Siri’ for the fastest route to the Steve Jobs Theater, only to find herself running across the knee-deep pond. 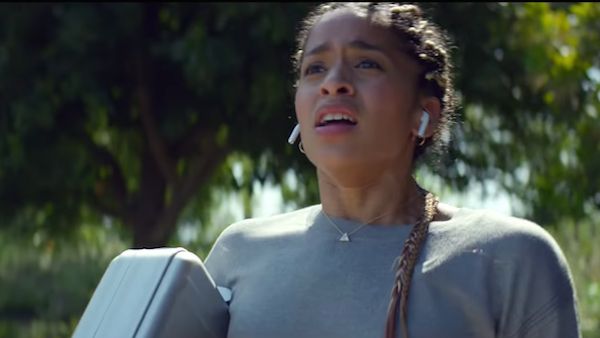 Throughout, her Airpods remain in-ear. She runs through a greenbelt and into a large cafeteria where she bumps into her colleague, who is casually eating. She continues making her way through the building, mid-way falling off a bike and jumping off stairs. Finally, she makes the safe delivery to Cook, who unveils the prized possession: ‘The Clicker’.